Distant relatives of modern lobsters, horseshoe crabs, and spiders, trilobites swam the planet’s prehistoric seas for 300 million years, from the Lower Cambrian to the end of the Permian eras—and they did so very capably. 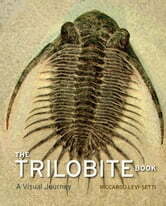 Trilobite fossils have been unearthed on every continent, with more than 20,000 species identified by science. One of the most arresting animals of our pre-dinosaur world, trilobites are also favorites among the fossil collectors of today, their crystalline eyes often the catalyst for a lifetime of paleontological devotion. And there is no collector more devoted—or more venerated—than Riccardo Levi-Setti. With The Trilobite Book, a much anticipated follow-up to his classic Trilobites, Levi-Setti brings us a glorious and revealing guide to these surreal arthropods of ancient Earth.